Though he suffered from chronic respiratory problems his entire life, Jean René Lacoste became a tennis star and lived to the ripe old age of 92. After his tennis career ended, he went on to create a clothing line that featured one of the world’s best-loved and most-worn garments — the cotton pique polo shirt, embroidered with the famous crocodile logo. Apart from designing the first line of performance clothing and introducing the first designer logo, René Lacoste also invented the metal tennis racket. Oh, and he painted landscapes in his spare time. 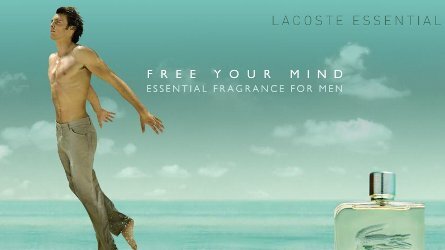 Lacoste Parfums makes three fragrances for men and the company stresses a “sporting attitude” — and uses words like “free spirit” “playful” “vitality” “energizing” “freedom” and “joie de vivre” in its advertising. Lacoste Essential for men contains aquatic citrus (tangerine, bergamot), tomato leaves, cassis, black pepper, rose, patchouli, sandalwood and “wood accord.” Essential opens with a strong “marine” note and harsh tangerine and bergamot (the fruits smell “green”/unripe). Almost immediately, the scent reveals notes of sour rose and sweet cassis — I do not smell tomato leaf, pepper or any woods. As Essential opens, so it remains. Since Essential stabilized and was ‘fixed’ almost from the first spray, I needed other things to occupy my mind, so I read this from Lacoste’s ad department: “The patented Time Release Technology in this unique fragrance results in the slow release of fresh, energetic top notes…. This energetic burst will be experienced throughout the length of the day….” Top notes are nice, and in many scents I prefer those fleeting notes above all others, but if one preserves, or time releases, the top notes, what happens to the rest of the scent — the middle, the base? I’m not a chemist so perhaps I’m asking a dumb question. I will say that Essential’s “top notes” remain active thru the life of the scent on skin. Lacoste Essential is clean, crisp and sure to offend no one; it comes in a variety of bath and body products. It’s too bad that the indefatigable (and inventive) René Lacoste never designed a fragrance for his company. For some reason, the ad looks like a “peter pan” perfume .. I liked Lacoste pour homme – the rum note in that was strangely addictive. I've never tried Lacoste Pour Homme but when reading about Essential I saw that Pour Homme was aimed at the more “mature man” (whatever THAT means) The ad for Pour Homme cracked me up…the furry naked man sitting in his chair sipping a cup of tea. I love lacoste Style in Play, it has an ozone note that is just like nothing else out there (at least on my skin) the blue version has some aniseed notes that are not so appealing for me. This “essentiel” I find a tad bland, but I should give it a try now that it is still summer here. Nice review Kevin!!! looking forward for more. Everyone is anonymous here and what is this preoccupation with the number four. I wear Lacoste now and again. I have found it to be underpowering and a little goes along way. The essential I haven`t tried ……. I have to sort out my budgeting!